Daytona Beach, FL - October 146, 2011 - Robert Buroker, Dane Westby and Michael Barnes took ASRA/Michelin Pro Series victories at the world famous Daytona Internationl Speedway today, capping another spectacular seaon for the series. Buroker, aboard his SGT Racing Ducati 748, took the win in Thunderbike over Douglas Fogg on the NewEngland Performance Buell 1200. Peter Meringolo finished third on his European Cycle Service Ducati 1000. Westby held off fellow M4 Suzuki pilot Elana Myers to take the victory in SportBike to cap off a great weekend in ASRA sanctioned competition. Shane Narbonne finished third on his Suzuki 600 making it a podium sweep for the brand. In SuperStock, Michael Barnes took his Eric Buelll Racing 1190 to the win over Jeff Lampe's Kawasaki 1000 with Santiago Villa holding on to the final podium position. For complete results, click here. For final championship standings, click here. Daytona Beach, FL - October 14, 2011 - Dane Westby on the M4 Suzuki 600 took advantge of a strategic error by MOB Racing to take victory at Daytona International Speedway by more than a full lap over second place Chester Auto Repair in the final round of the 2011 Michelin Team Challenge Championship. MOB Racing ran short of fuel to give up the lead to the M4 machine and Westby was able to cruise to victory over the final laps of the event. Alton, VA – September 25, 2011 – Although satellite images looked clear and the forecast predicted blue sky, another heavily clouded day greeted fans at VIR Sunday as riders prepared to settle a few 2011 regional championships. Several of the Michelin PRO Series riders were also thinking beyond this round to the Daytona finale just three weeks away. Rain having fouled qualifying on Saturday, the Michelin PRO Superstock lineup found fast riders mingled throughout the starting grid. The track was dry with temperatures in the high 70’s at race time. Reese Wacker was on the front row for Sportbike and took advantage immediately by grabbing the holeshot on his Suzuki. Entering turn three Wacker had a three length lead over Kawasaki-equipped riders Jeff Lampe and Felipe MacLean. Moments later Tim Bemisderfer used his Vesrah Suzuki to slice inside of MacLean and Lampe into second place. By lap two Bemisderfer caught Wacker starting their brief dual for the lead which Wacker would relinquish a lap later. By the end of lap three the order was Bemisderfer from BMW rider Sean Dwyer from Wacker and Lampe. Eric Helmbach was fifth on his BMW as they crossed the stripe. Suzuki rider Lloyd Bayley was sixth. Local favorite and frequent champion Scott Carpenter lay seventh. On lap six Bayley made his move on Helmbach for fifth place as Bemisderfer remained ahead of Dwyer and Wacker at the front. The order would remain much unchanged as Tim Bemisderfer took the win by a margin of four tenths of a second from Dwyer. Reese Wacker was eight seconds back in third rounding out the podium. In the Amateur Superstock Tony Leong’s Suzuki led early, but on lap two Jeremy Cook snatched the top spot with his BMW 1000. Austin Burkett was third on a Honda. Cook would maintain his pace and the order would hold to the checkered flag with Cook taking the win. These three fellows are now locked in the tightest points contest for a Michelin championship going into the final round. Thunderbike promised a battle as Brian Kcraget and Robert Buroker were both on the grid. Kcraget’s Suzuki SV650 started from the front row with Ducati 748 mounted Buroker on row two. Veteran rider Russell Masecar aboard another SV650 got the holeshot followed by Kcraget, Douglass Fogg and Joe Cotterino. By the end of lap one it was all Kcraget as he led from Buroker, Masecar and Fogg. Kcraget and Buroker turned similar lap times throughout the race. Buroker closed the gap a little on lap three. Kcraget responded with his best lap of the race, a 1:34.385 on lap four to maintain his lead. By race end Kcraget had managed a comfortable 4.9 second lead from Buroker with Masecar 15 seconds in arrears completing the podium for Michelin PRO Thunderbike. Jared McCoig piloted his Ducati 749 to the amateur Thunderbike victory. Mark Miller was looking for a win on the Del Mar Yamaha R6 in Michelin PRO Sportbike, and he would have his hands full as P.J. Jacobsen was on hand with another R6. Past champion Jim Cohrs, although present did not grid. Miller started from front row, Jacobsen from row three between Joel Spalding’s Ducati 848 and Jim Fotinopoulos‘ R6. Miller took advantage of his grid position and got the holeshot leading down into turn one, but by turn three Jacobsen was directly behind Miller. By the time the field passed the flag stand it was Jacobsen from Miller with about a one second gap. Justin Holderman who also got a nice start from row 2 on his Yamaha was one second behind Miller. Matt Brown and Fotinopoulos were fourth and fifth respectively. Miller ran consistent 1:31’s. Jacobsen ran consistent 1:30’s for the duration of the event with a best time on the last lap of 1:29.809 pulling out a 13-second victory over Miller. Holderman was 14 seconds in arrears of Miller rounding out the podium. Tony Leong took the amateur Sportbike win on his GSXR 600 with Pulak Datt second on a Honda and James McCoig third on a Ducati 749. After this penultimate Michelin PRO Series round some scores have been settled. Joel Spalding wrapped up the Sportbike championship on his Ducati 848 with an insurmountable lead of 63 points as teams head for the final round. The Amateur Sportbike title is still up for grabs between riders Tony Leong and Darrin Klemens. Klemens has a 34-point lead. So expect Leong to be gunning for him at Daytona. Ray Hofman has clenched the 2011 Michelin PRO Thunderbike title with 159 points to his credit. David Hanig will be the 2011 Amateur Thunderbike class champion with 93 points so far on the season and no one close enough to give him a challenge. Second place in the class however is a dead heat at 80 points between Joey Thomas and Douglass Fogg. Michelin PRO Superstock remains the class to watch as Tim Bemisderfer, who has barely put a foot wrong all season goes to Daytona with Joel Spalding down by eight points. Spalding will need everything he can muster and a little luck to pull off this championship with Bemisderfer in the driver’s seat as we head toward Round 8. Amateur Superstock also promises another showdown in a three-way points battle that has Jeremy Cook with a three-point lead over Austin Burkett who leads Tony Leong by just six points. No doubt there will be a lot of pressure on these three riders as they prepare to dual it out in the final sprint of the season. Showers hampered ASRA practice and Michelin PRO Series qualifying at Virginia International Raceway Saturday. The wet track protected any lap records. Ducati pilot Paul Decouto took the Michelin PRO Superstock pole with a time of 1:49.758. Suzuki rider Reese Wacker, Felipe MacLean on a Kawasaki and BMW rider Eric Helmbach filled out the front row. In Superstock Amateur, Austin Burkett qualified his Honda 1000 on the pole for Sunday’s Superstock race. Joe Cotterino put his Ducati 1000 took the Michelin PRO Thunderbike pole with a lap time of 1:51.886. Buell rider Douglas Fogg, Brian Kcraget and Russell Masecar, both on Suzuki’s, completed the Thunderbike front row. Kawasaki rider Matt Brown took the pole in Michelin PRO Sportbike with a lap time of 1:54.280. Yamaha riders Jim Cohrs and Mark Miller Jr. placed second and third. And Pulak Datt put his Honda on the Amateur Sportbike pole. Summit Point, WV - August 28, 2011 – After Round 6 of the Michelin Team Challenge the points race looked as exciting as the races themselves. In the Overall points only eight points separated Scotty and Meghan Ryan's Stiles' Racing Yamaha R6 from Eric Helmbach's BMW, with another eight points back to Tim Ivanoff's Buell. Even tighter was the GTO points chase with Helmbach and Ivanoff deadlocked at 182 points each. As riders poured into Summit Point for Round 7 the weather on Friday was excellent. Saturday weather had its wet spots with the spillover from Hurricane Irene, but Sunday was clear again with blue skies, a steady breeze and not a drop of moisture to be found. Summit Point's track length is 2.02 miles, so the two-hour time limited event Team challenge was set for 75 laps. From the green flag Eric Helmbach used the power of the Chester Auto Repair BMW S1000RR to motor away from the field and led at the end of lap one by two seconds over Lloyd Bayley on the LB Athletics Suzuki 1000 and Walt Sipp aboard Tim Ivanoff's Thrashed Bike Racing Buell 1125RR. By lap four Scotty Ryan had driven the Stiles Racing R6 out of the field and past Sipp to grab third place. Helmbach continued to lap the circuit in the mid 1:17's building a gap to Bayley of 7 seconds by lap five. By lap seven Ryan was nose to tail with Bayley looking for a way to move into second position. Bayley was equally determined not to let him by. Still Ryan prodded for eight laps until Bayley's shift linkage failed sending him off course in turn one. As Bayley nursed the Suzuki back to the pits for repairs Ryan set his sights on Helmbach. Bayley never retired from the race, electing to find parts and get back on track and score as many laps as he could muster. By lap 19 the gap from Helmbach to Ryan was 11 seconds and from Ryan to Sipp 20 seconds. Rick Beggs was in fourth place although 19 seconds behind Sipp. This order continued for some time. On lap 30 Helmbach had lapped much of the field and caught Beggs, still running in fourth. On lap 31 pit stops commenced with the Hawaiian Racing Suzuki 750 coming in for fuel. On lap 33 Martinez Motorsports ZX10R came in for fuel and a rider change. On lap 35 Premier Racing's Yamaha R6 came to the pits for repairs after an agricultural incident in turn one. Also pitting on lap 35 were the leaders Helmbach and Ryan. Helmbach made quick work of his stop taking on fuel. Ryan took a little longer as his scoring transponder had to be replaced having come off sometime in the early laps of the race. Sipp also pitted for fuel on lap 35 putting all the front runners on equal footing to finish the race. After pit stops Helmbach was on autopilot as lap after lap he guided his BMW ever closer to checkered flag. The exit of Ryan's R6 moved RNR Racing's Rick Begg's up to the number two overall podium spot and first in GTU. Beggs would hold onto second, finishing behind Helmbach. Calvin Martinez rounded out the Overall Podium and was second in GTO with Jim Barry on a Yamaha R1 pulling down third in GTO. Finishing behind Beggs in GTU were Daniel Dougherty on the Premier Racing R6 and Justeen Cicio on her Moto Medusa Honda CBR. In GT Lights Dennie Huff continued his winning ways topping the podium with Colin Lieby and Frank De La Renta finishing second and third repectively. For complete results, click here. For current points standings, click here. Millville, NJ – Under sunny skies and warm temperatures the ASRA/Michelin Pro Series competitors took to the track to start the Saturday action at the NJMP Thunderbolt Course. Opening the qualifying sessions was the Sportbike class and Blake Kelly held off fellow Yamaha riders Jin Cohrs and 2010 ASRA SuperBike Champion Mark Miller Jr to capture his first Michelin Pro Series pole position and the point that goes with it. For Michelin Pro ThunderBikes it was Peter Meringolo who took the pole position with his final lap of 1:31.919 to set a new qualifying record for the course. He was followed by Joey Thomas, the former record holder, then David Zylberberg. All three were on Ducati 1000’s and Meringolo’s qualifying effort made it two riders taking their first Michelin Pro Series pole positions this weekend. In Michelin Pro Series SuperStock qualifying was down to the wire as Timothy Bemisderfer and Lloyd Bailey took their Suzuki 1000’s to the final lap of qualifying before Bemisderfer was able to pull out the pole position for Sunday’s final event. It was Bemisderfer at 1:26.665, edging Bailey by .382 seconds with Blake Kelly in third .568 seconds behind Bemisderfer. For complete qualifying results, click here. Brian Hall took a solid win in Michelin Pro Series SuperStock but it was Joel Spalding who increased is point lead in the class for 2011. Spalding, by his third place finish, moved to a 29-point lead over Tim Bemisderfer and a 36-point lead over Hall in his quest for a second straight title in the class. Dan Ortega took advantage of the rain that dampened the track during the Michelin Pro SportBike race and took his first win in ASRA competition over Dave Ebben. Ebben took off from the field in the dry but the change to rain tires was just enough to allow Ortega to pullout the victory. Joel Spalding finished third but Ortega's performance narrowed his point lead to just 14 points over Ortega and 16 over Scotty Ryan in the 2011 Michelin Pro SportBike title chase. In ThunderBike Walt Sipp continues to chip away at Ray Hofman's lead by taking his second win of 2011 and narrowing the point lead to 59 in the Championship. Todd Evans helped fellow Buell rider Sipp by finishing second and pushing Hofman back to third on his Suzuki 650. Iowa's Craig Davis took his second win of 2011 in Amateur SuperStock and now leads Austin Burkett from Virginia by 22-points with three rounds remaining in the series. For complete results click here. For current point standings click here. In the early part of the Michelin Team Challenge sanctioned by ASRA at Blackhawk Farms Raceway it looked like the Martinez Motorsports Team was headed for disaster as they found themselves slipping further back in the field with each passing lap. By the 25th lap the D2 Cycles team of Michael Garner and Ricardo Valdez had put former National Champions a full lap down and mechanical woes threatened to sideline Calvin Martinez and Martinez Motorsports teammate Jason Farrell. It was that point of the event the defending National Champion Chester Auto Repair with Eric Helmbach and Alex Shaw who took the lead when D2 Cycles stopped for the first time. With a pit stop at lap 34, Martinez Motorsports swapped riders and completed repairs to bring their machine back to life but left the pits a full 3-laps down to Chester Auto Repair. To add insult to injury, one of the Martinez crew was not dressed appropriately to work on the machine during the stop so Farrell was black flagged for a stop and go penalty the next lap. As Martinez Motorsports was exiting the pits from the penalty, Chester Auto came down pit road and handed the lead to Thrashed Bike Racing with Walt Sipp and Joel Spalding on lap 40 and allowing Martinez Motorsports to regain the first of the three laps they needed to challenge for the win. At this point The D2 Cycles machine developed an oil leak that ended their day, leaving only Thrashed Bike Racing and Chester Auto Repair as the only two machines on the lead lap and Stiles Racing, the current Overall Championship leader, one lap behind and Martinez Motorsports two laps down. Things got interesting from lap 40 on as Farrell dropped into the 1:10 range while the race leaders continued their consistent 1:15 pace trying to complete the 75 laps before the Martinez Motorsports machine could recover. On lap 47, Thrashed Bike stopped for their rider change and fuel, putting Chester Auto back into the lead for the final time and allowing Martinez Motorsports to gain the second lap they need to get to the front. Now only one lap down with 27 laps to the finish it became a race of speed versus team strategy between Chester Auto Repair and Martinez Motorsports. On lap 57, Martinez Motorsports passed Chester Auto to move to the tail end of the lead lap and set sail trying to make up the nearly 2-miles they were behind before the checkered flag. While everyone was watching the progress of Martinez Motorsports, Stiles Racing had quietly gotten themselves back on the lead lap too, so now the top four overall were on the same lap looking for the win. On lap 59, Stiles Racing with husband and wife team Scotty and Meghan Ryan, were the first to fall to the 1:10 pace Martinez Racing continued to run. On lap 67 it was the Thrashed Bike Racing team that watched Martinez Motorsports move past and set sail after the race leader, Chester Auto Repair who was 9 seconds ahead with 8 laps to go. While Shaw tried to up the pace on the BMW of Chester Auto, the Martinez Motorsports juggernaut made short work of the lead and made the pass for first place on lap 71 then cruised to the victory, first Overall and first in GTO. Chester Auto Repair finished second Overall and second in GTO while Stiles Racing took third Overall and the class win in GTU. Thrashed Bike Racing held on for fourth Overall and third in GTO. With the solid performance of Stiles Racing, they continue to lead the 2011 Michelin Team Challenge Overall Championship by 8 points over Chester Auto Repair, 167 to 159, with Thrashed Bike Racing in third with 151points and two rounds to go to decide the Overall championship. The Old Glory Speed Shop team captured its first National Championship in the GTL class with another win and a 93 point lead over runner up Saddlebaum Racing with only 70 possible points remaining. For the GTU Championship, Stiles Racing opened up a 27 point lead over 2010 Champion RnR Repsol Racing and a 69 point lead over third place Premier Racing. The battle for the GTO Championship is going down to the wire as Thrashed Bike Racing is now tied with defending champions Chester Auto Repair with 182 points each, while Martinez Motorsport moves into third at 93 points with 2 rounds remaining. The 89 point lead insures that either a BMW or a Buell will be the 2011 Michelin Team Challenge GTO Champion. For complete results click here. For updated Michelin Team Challenge points click here. The next round of the Michelin Team Challenge Series sanctioned by ASRA will take place on August 29 at Summit Point Raceway during the Summer Cyclefest. Check out the complete final results for the ASRA sanctioned Michelin Team Challenge at VIR here! Updated Championship Standings can be found here! Check out the complete final results for the ASRA sanctioned classes at the 88th Annual Loudon Classic here! Michelin Pro Series Qualifying from Sunday June 19th! Click here for the rundown. Summit Point Cyclefest Rocks Memorial Day! With over 895 entries for the Summit Point Cyclefest things were really cooking at the Summit Point Circuit this Memorial Day. Check out qualifying and final results from Monday afternoon's Michelin Pro Series races along with the curren championship standings. Check out the complete final results from the Memorial Day Cyclefest here! Michelin Pro Series Qualifying from Sunday May 29th! Click here for the rundown. Millville, NJ – For those that are superstitious, Friday the 13th never works out well and it seemed the Stiles Racing Team was falling into that category. With clutch problems nagging their Yamaha R-6, the team decided to do a fast swap shortly before the start of the 200km race, only to have problems reassembling the unit and installing the cover. With just minutes to go before the green flag, it looked like they would be working to salvage a points-paying finish, instead of setting the pace for the Michelin Team Challenge event at New Jersey Motorsports Park on May 13. Well Lady Luck smiled on the team as they sealed the cover just as the final call went out for the event and lead rider Scotty Ryan took off to make the start with the other 26 competitors for the 69 lap race. The holeshot belonged to the Plenty Money Racing GSXR 750 and the Hatfield PA based team held off Stiles Racing for the first two laps but Scotty Ryan pushed their R-6 to the front on lap 3 and took off like a man possessed. Once things settled down, the Plenty Money team of John Palmer and Ryan Manotti spent the next few laps getting up to the pace set by Stiles Racing and made their move to regain the lead on lap 11, leaving the Stiles team to follow their lead for the next 20 laps. On lap 31, Stiles Racing made their only scheduled stop for fuel, sending Scotty Ryan back out in less than 30 seconds. On lap 34 the Plenty Money machine came down pit road handing the lead over to the Trashed Bike Racing Buell with Walt Sipp at the controls. While Stiles Racing finished their stop in near record time, the Plenty Money crew took nearly 90 seconds to complete their service, change riders and get back out into the fray. That extra time was all Stiles Racing needed to put them into position to take the Overall win from Plenty Money, and now they set their sights on the Thrashed Bike Buell. It took 6 laps for Stiles Racing to track down the Thrashed Bike machine and resume the lead on lap 42. With Stiles Racing in the lead it was time for Sipp to bring the Buell down pit road. Thrashed Bike’s lightning fast stop would prove to be a problem just 20 laps later when the low fuel light would come on, forcing another stop just two laps shy of the end for a splash of fuel to finish the race. With that second stop by Thrashed Bike Racing, the Stiles Racing crew knew that the Overall victory was theirs to lose and cruised on home for another win in the Michelin Team Challenge Series and the point lead for the Overall Championship by 9 points with 4 rounds left. In the GTL class, it looked like Saddlebaum Racing was on the way to another class win when mechanical difficulties sidelined their Suzuki after 41 laps. That opened the door to the Old Glory Speed Shop team to coast to victory by 2 laps over runner-up M&M Racing and 4 laps over the third place Team Dangerous. Click here for complete event results from Round 4 at NJMP. Celebrating its 10th year, the ASRA Michelin Pro Team Challenge endurance series heads to New Jersey Motorsports Park this weekend, May 13-15, for its 4th round on Friday at 3:45pm. This event also marks the first running of the Atlantic Team Challenge, a new endurance series established this year by New Jersey Motorsports Park, with the same rule set. It will run in conjunction with the Michelin Pro Team Challenge race. "The first year of the 200mi/250K Team Challenge was 2001 when it was introduced by the former National RoadRace Series (sanctioned by FormulaUSA), then under the regime of Clear Channel Motorsports, who I worked for at the time." said Kevin Elliott, owner of ASRA and CCS. "The overall structure of this endurance series hasn't changed much since the beginning, and its popularity continues to grow." "Our endurance series is unique because both Amateur and Expert riders can participate on the same team, racing on a single machine." Elliott said. "A degree of mentoring develops between the pros and novices which is unparalleled anywhere else that I'm aware of. Because of the experience gained during the Team Challenge, I've seen many riders improve their racing skills by leaps and bounds." He added, "But, I've never seen the competition this fierce in the history of the series! The Overall Championship points spread for the top 5 spots is only 9 points now. Literally anything can happen during the last half of the season." The action doesn't stop there! You won't want to miss Saturday and Sunday when the Championship Cup Series riders and SideCar machines take to the track in 29 thrilling races. Gates are scheduled to open at 7:00am Friday, Saturday and Sunday. Brian Hall set a new lap record in SuperStock of 1:41.763 breaking a record held by Robert Jensen for three years. 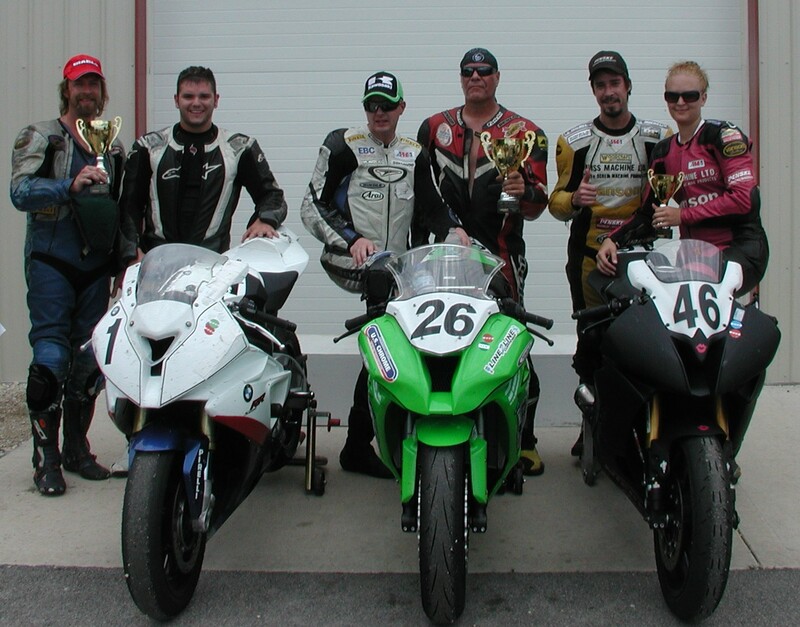 Jason Farrell won SuperStock and SportBike on his Speed Tech Kawasaki ZX10 and ZX6 respectively. For complete results, click here! For up to date championship standings, click here! Just before sunrise on Friday morning, the Topeka area was inundated by powerful thunderstorms with hail and lightning that had the competitors wondering if there was any hope for the days on track activities. But for once the weatherman was right and by 9:00am the rain had stopped and the drying process began with Heartland Park-Topeka officials putting in a herculean effort to get the facility ready for the 3:30pm start time. While most of the practice was done on a wet or damp surface, the track was clean and dry for the start of the Michelin Team Challenge final. Once again the first bike off the line was the Thrashed Bike Racing Buell 1125R followed by Cyclepath Racing and both of the Martinez Motorsports entries. After the first revolution of the 2.5 mile road course, it was the Martinez Motorsports Kawasaki ZX10 leading the way with the D2 Cycles #2 ZX 10 right on their heels, but that would hold for just 2 laps. On lap 3 the D2 Cycles team of Mike Garner and Ricky Valdez took the lead with Jason Farrell on the Martinez Motorsports machine right on their heels. D2 Cycles joy was short lived as Martinez Motorsports regained the lead on lap 8 then an unscheduled pit stop for mechanical problems one lap later took the D2 team out of contention. With the D2 team gone it may have seemed that Martinez Motorsports would have an easy time of it but the Valdez Racing Yamaha R6 quickly replaced D2 as a serious threat for the Overall win by taking the lead on lap 13. The two front-runners continued to swap the lead until Valdez Racing made their scheduled pit stop on lap 22, the halfway point of the contest, and their lengthy stop left them nearly 1 minute behind Farrell. Martinez Motorsports pitted for a splash of fuel on lap 31 handing the lead over to the Thrashed Bike Racing Team Buell, who returned the favor by pitting on lap 35, leaving the Martinez Motorsports Kawasaki out in front to cruise to the Overall victory. Valdez Racing held on for 2nd Overall and 1st in GTU followed by Thrashed Bike Racing in 3rd Overall and 2nd in GTO. Defending GTO and Michelin Team Challenge Champion Chester Auto Repair finished 3rd in GTO to stay in the hunt for a second straight class championship. The GTU class was a study in contrasts as Valdez Racing took off like a rabbit while Stiles Racing set the a measured pace to insure they made up for their misfortune Carolina Motorsports Park two weeks prior. Stiles used their pit road experience and consistent laps to keep themselves within striking distance of the class leader, ready to take advantage of any mishap that may befall the Valdez team, while keeping an eye on the larger picture of the championship chase. At the end of the race it was Valdez Racing by 51 seconds over Stiles Racing in 2nd followed by Huff Racing in 3rd place. With the GTL point leader Saddlebaum Racing a no-show at Heartland Park, they opened the door for Old Glory Speed Shop and Dennie Huff’s team wasted no time in trying to capitalize. Old Glory took the holeshot and led Tank Slappers Racing for the first 4 laps, then Tank Slappers moved to the point for the next 9 laps before relinquishing the lead back to Old Glory. With a pit stop on lap 15, Tank Slappers slipped in 3rd place as G-Baby Racing swept past while they were servicing their Suzuki SV650 on pit road. It looked like the battle was on when Tank Slappers moved past G-Baby back into second but that was short-lived when a crash in turn 5 ended Tank Slappers day on lap 17. With Tank Slappers gone and G-Baby on a 2 stop pit strategy Old Gory Speed Shop cruised to a easy victory in GTL. The victory gives Old Glory a 21 point lead over Saddlebaum Racing in the class with 5 rounds left in the Michelin Team Challenge GTL championship for 2011. Warm, sunny weather on Saturday gave way to Sunday's cool temps and a damp start for riders in Round 2 of the Michelin Team Challenge. The series returned to the heart of the Palmetto State as perennial favorites and newcomers prepared to vie for the lead in the 2011 points race. The action got started just after noon and though the cool temperatures might have helped with tire preservation, it did nothing to dampen the racing action. The holeshot belonged to Walt Sipp aboard Tim Ivanoff's Thrashed Bike Racing Buell 1125R. Trailing Sipp into the first corner were the Chester Auto Repair BMW S1000RR entry ridden by Eric Helmbach, Dustin Young on the Martinez Motorsports Kawasaki ZX10R and GTU favorite Scotty Ryan on the Team Stiles R6. By the time the leaders reached the back straight kink Helmbach had the lead from Sipp and Ryan was third. For the first ten laps Sipp literally rode the tires of the Buell staying right with Helmbach's BMW before the Buell back tire started to heat up. Sipp backed off tying to get a little heat out of his rear tire thus letting Ryan's Yamaha close in. By quarter distance Helmbach held the lead by about 3 seconds as the leaders circulated through the kink. Sipp and Ryan were nose to tail and two laps later Ryan got by Sipp on the backside of the track and started to stretch the R6's legs. Helmbach, though riding a conservative pace to make up for lost points in the Turn 5 incident in the last round at Roebling Road, was showing the field what the big BMW could do as he built his gap on the field to over 8 seconds by half distance. As Walt Sipp started to work his lap times down again, and for no reason he could discern, he lost the front end on the Buell in Turn 4. The spill sent rider and bike skittering up the race surface all the way into Turn 5. Sipp gathered up the damaged machine and clutching the detached left clip-on in his hand, lever still intact, limped the Thrashed Bike entry back to the pits for extensive repairs. At the end of lap 26 Ryan pitted for fuel. On the very next lap Helmbach was in for fuel and successfully returned to racing without relinquishing the lead. Martinez Motorsports rider Dustin Young, running fourth pitted around Lap 34 to add fuel and put Calvin Martinez aboard. But within three laps corner marshals were reporting the Martinez Motorsports Kawasaki smoking. Martinez was flagged and returned to the pits, ending his team's run in the GTO class. At two-thirds distance Nick Hansen returned the Thrashed Bike Buell to the race. The team would soldier on for third in class behind returning endurance racer Jim Barry on his Yamaha R1. The order at the front was Helmbach from Ryan, then Premier Racing's Dougherty and Horton followed by Rachel Sasse on the RNR Repsol Kawasaki, and Mark Miller on the Saddlebaum Racing SV650. But the complexion of the race was about to change. Scotty Ryan seemed to be willing his Yamaha onward, narrowing the gap to Helmbach. For nine straight laps Ryan worked on the gap knocking off a half second here and a second there, showing Helmbach a wheel between twelve and thirteen, trying to work his way inside at turn eleven, until on Lap 54 the pair were only 0.07 seconds apart at the stripe. Ryan could close in over the slower sections, but Helmbach used power and smoothness to keep Ryan from closing the deal. On Lap 57 Ryan pitted for his final fuel stop. Upon exit from the pits he was down 38 seconds to Helmbach who would stop two laps later for his final splash of fuel. When the final shuffle was done Ryan had dropped from trailing by a mere 0.1-second gap to a 12-second gap with five laps to go. Scotty Ryan had to push and push hard to make up the deficit. On lap 59 the push came to an end as approaching Turn 12 Ryan's front brake faded sending him off track, ending his day and dashing his hopes for the overall or the GTU class win. Helmbach cruised home for the Overall and GTO class victory. Rachel Sasse showing a lot of grit and skill brought the RNR Repsol Kawasaki ZX6R home for the GTU class win and Mark Miller nailed the top GT Lights spot on the Saddlebaum Suzuki SV650 ahead of the Old Glory Speed Shop Buell, whose team worked through the afternoon and evening before the enduro swapping out a blown motor..
Bloomingdale, GA – Beautiful weather at Roebling Road welcomed Round One of the Michelin Pro Series 10-lap sprint races. Temperatures were in the mid seventies with a variable breeze. The ASRA riders couldn't have asked for a better day for the start of their 2011 season. In SuperStock Tim Hunt and Tim Bemisderfer both started from the front row, but while Bemisderfer's start looked a little choppy, Hunt launched cleanly and by turn one Hunt had the advantage. At the end of the first lap Hunt and Bemisderfer started to pull away a little from Jason Farrell and Nate Kern. It looked like Bemisderfer would give Hunt everything he could handle by lap three as the pair were almost inseparable as they crossed start finish. In ThunderBike Trey Yonce got the hole shot on his Suzuki SV650 and although Ducati rider Joey Thomas started from the last row on the grid, by the end of lap one he was only five seconds behind Yonce. If Thomas had any hopes of catching Yonce those soon faded as lap after lap Trey Yonce added a second to his gap on the field. By the end of lap five the gap had stabilized at seven seconds as Yonce backed off a little. The final Michelin Pro class of the event was Michelin Pro SportBike. Jim Cohrs on an R6 snatched an early lead and separated himself from the pack, at one time leading by more than six seconds. Jason Farrell aboard his Kawasaki fought back from an early deficit to close the gap down to about 3.5 seconds by the last lap. Cohrs hung on, winning decisively and capping a win-filled weekend. Cohrs knocked down nine victories in all. Bloomingdale, GA – Perfect weather at Roebling Road welcomed Round One of the Michelin Pro Series and Michelin Team Challenge. With temperatures hovering in the low seventies, a cloudless sky, and a light breeze, the weather was flawless for the start the 2011 ASRA season. Saturday's Team Challenge race was punctuated by two red flags during the course of the event, neither resulting in major injuries. The second restart was flawless for rider Meghan Ryan who not only showed perfect timing and speed, but also carried her starting advantage for the full lap and set the tempo for Team Stiles in their final dash to the GTU class and Overall victories aboard their Yamaha R6. For current points standings after Round 1 click here. There are some major changes in store for the Michelin Pro Series sanctioned by ASRA for the 2011 season, both in class structure and format, targeting greater participation across the series. Gone is the old ASRA Superbike class. While it gave some riders the opportunity to increase their winnings, the redundancy with SportBike had brought participation down to unsustainable levels. By eliminating this class, the Michelin Pro Series now has three main classes, SuperStock, SportBike and ThunderBike. With the demise of the Pirelli Diablo Challenge at the Championship Cup Series events, Amateur ranked riders no longer had a cash contingnecy offering in any class, so the Michelin Pro Series has decided to add Amateur classes to the program for 2011. While they will share the track at the same time as the ASRA Experts, ASRA Amateurs will be competing against other Amateurs for their own cash contingency. Amateurs will be gridded in SuperStock, SportBike and ThunderBike by qualifying times whenever possible and start as a second wave behind the Expert field. Just like the Experts, Amateurs will be competing over the 8 race series for ASRA National Championships, with the championships to be awarded at the 28th Annual Race of Champions in Daytona Beach on October 16, 2011. We look forward to seeing alll of you at the races in 2011!